According to the latest NBC/WSJ poll, President Obama had a five-point lead when survey participants were asked who they would vote for, and 42 percent of those surveyed believe the economy will get better under Obama. NBC's Chuck Todd reports. Fueled by increased optimism about the economy and nation’s direction, President Barack Obama leads Mitt Romney by 5 points among likely voters and now sees his job-approval rating reaching the 50 percent threshold for the first time since March, according to a new NBC News/Wall Street Journal poll. The survey – which was conducted after the two party conventions and the political firestorm over last week’s U.S. Embassy attacks, but before Romney’s controversial comments about the 47 percent of the country “who are dependent on government” – shows the percentages believing that the country is headed in the right direction and thinking that the economy will improve at their highest levels since 2009. In the presidential horse race, Obama and Vice President Joe Biden get the support of 50 percent of likely voters, while Romney and running mate Paul Ryan get 45 percent. National Review and Bloomberg View's Ramesh Ponnuru, Roll Call's Shira Toeplitz and The Hotline's Reid Wilson take a look at the latest numbers out of the NBC, Wall Street Journal and Marist poll and talk about how battleground states may play out for the presidential candidates. Among a wider sample of registered voters, the president’s lead is 6 points, 50 percent to 44 percent – up from Obama’s 4-point edge last month, 48 percent to 44 percent. “It’s clear to me that Barack Obama has moved a … step ahead,” says Democratic pollster Peter D. Hart, who conducted this survey with Republican pollster Bill McInturff. 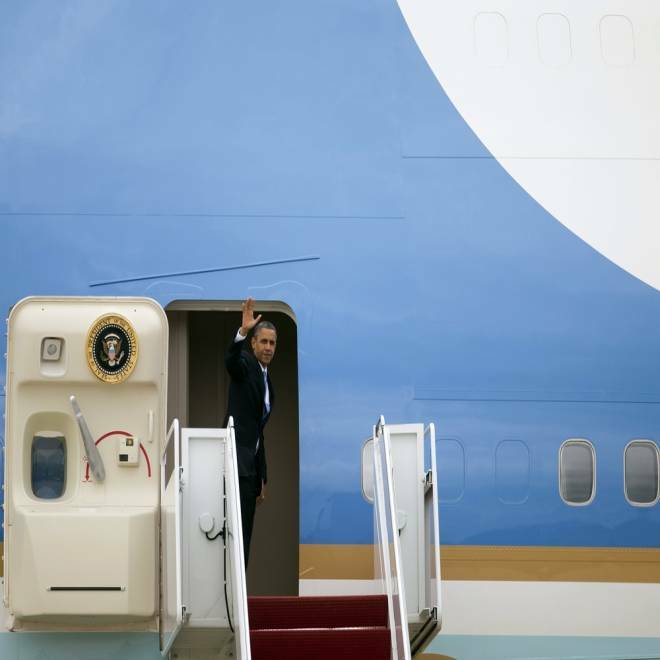 President Barack Obama waves as he boards Air Force One on Tuesday, Sept. 18, 2012 in Andrews Air Force Base, Md. But noting similarities between the current numbers and those from the 2004 George W. Bush vs. John Kerry race, he urges that this contest could be just as competitive. According to the survey, 39 percent of registered voters say the country is on the right track, versus 55 percent who say it’s on the wrong track. That right-track number is a 7-point increase from August, and it’s the highest percentage on this question since Sept. 2009. Forty-two percent of voters also believe the economy will improve in the next 12 months, which is a 6-point jump from August, and a 15-point rise from July. What’s more, 47 percent of registered voters approve of the president’s handling of the economy – up 3 points from last month. Obama’s overall job-approval rating stands at 50 percent for the first time since March. And 38 percent say the country is better off than it was when he became president, which is a 7-point increase from August. But a plurality of voters – 41 percent – maintain that the country is worse off; 21 percent say it’s in the same place. While none of these numbers is ideal for a president facing re-election, Obama is now tied with Romney (43 percent to 43 percent) on which candidate would be better on the economy. In July, Romney held a 6-point advantage on this question. On other issues, Obama leads Romney on dealing with taxes (45 percent to 39 percent) and on dealing with Medicare (47 percent to 37 percent). And the president is ahead of his Republican challenger on three character traits – being a good commander in chief (45 percent to 38 percent), dealing with issues of concern to women (54 percent to 26 percent), and looking out for the middle class (53 percent to 34 percent). NBC's Chuck Todd says, "Mitt Romney is not a good campaigner" and still must answer questions regarding his comments that were caught on tape. A Morning Joe panel then debates whether Team Romney needs a campaign shakeup. Although Obama enjoys these advantages over Romney, the numbers in the NBC/WSJ poll bear a striking resemblance to those from 2004, when Bush narrowly beat Kerry. And that has McInturff, the GOP pollster, cautioning that this year’s race could be equally close, despite Obama’s current lead. Indeed, in the Sept. 2004 NBC/WSJ poll, 39 percent believed the country was on the right track (versus 39 percent now); 43 percent thought the economy would improve in the next year (versus 42 percent now); and Bush led Kerry by three points among likely voters (versus Obama’s 5-point edge now). The NBC/WSJ poll was conducted Sept. 12-16 of 900 registered voters (including 270 by cell phone), and it has margin of error of plus-minus 3.3 percentage points. In that sample, the survey also identified 736 likely voters, and the margin of error there is plus-minus 3.6 percentage points.